The Afterbeat Drum School was founded by Chris Beers, a 1993 graduate of the Berklee College of Music in Boston, known as one of the top music colleges in the country with a distinctive focus on jazz and modern music. At Berklee, Chris studied with several prominent drummers including Gary Chaffee, Alan Dawson, Giovanni Hidalgo, Ed Uribe, John Ramsay, Steve Wilkes, Ian Froman and Sa Davis. While there, Chris played for two years with the Berklee Samba Troupe. Chris has over 20 years of experience teaching both children and adults. He has taught students of all ages and skill levels. Past teaching positions include drum/percussion instructor at the Rocky Mountain Center for Musical Arts in Boulder, the Colorado Drum Institute (CDI), Boulder Arts Academy, the LA Music and Arts School in Los Angeles, and the Middlesex Summer Arts Program in Concord, MA. For the Middlesex Program, Chris developed percussion groups, recording classes and rock ensembles for kids ages 8-16. In LA, his students worked from a book he created which offers an overview of basic rhythms and instruction on how to develop independence on the drum set. Chris also led an afterschool Samba drumming program at the Bixby School in Boulder. In the fall of 2009, as part of his ongoing music education, Chris spent two weeks in Cuba in a percussive intensive study with Chuck Silverman, known worldwide as a specialist in applying Afro-Caribbean rhythms to the drum set. More information on Chuck's research programs and drumming in Cuba can be found here. Throughout this time, Chris has maintained a private teaching practice in addition to gigs and studio work. Chris grew up in Acton, MA and currently lives in Louisville, CO with his wife and three children. Chris has over 20 years of performance experience playing a variety of music from pop to heavy rock, jazz to electronica, blues to funk, reggae to Latin, soul to folk, and everything in between. Currently, he is the drummer for SoundRabbit, an original folk/pop foursome that is generating quite a buzz on the Denver/Boulder music scene. In 2009, SoundRabbit was nominated by Westword magazine as Best Rock Band in Colorado and as Best Band in Boulder by the Boulder Weekly. The band also won Best Pop/Rock Album By A New Band from the Mile High Music Store in Denver for their first album, This Room Becomes a Crowd. Chris tours with SoundRabbit a few times a year playing cities and college towns up and down the east and west coasts and throughout the U.S. Prior to the current gig with SoundRabbit, Chris spent time in the Mediterranean playing with a jazz trio aboard the Grand Princess Cruise Ship; opened for Los Lobos in LA; and played in a band with Sonny Mone, former guitar player for Neil Young's seminal band, Crazy Horse. He has toured the east and west coasts with blues, folk, rock and soul groups. Other local projects include work as the drummer for Easy Bill and the Big Beat, a Denver-based rhythm and blues band, laying down funk/soul grooves with Meadowlark Jivin out of Ft. Collins, drumming for Jaka, an African four piece, and live drum and bass/breakbeats with MFA: The Drop. Chris has also played in several musical theatre performances including Menopause, the Musical; You're A Good Man Charlie Brown, A Chorus Line, Crazy for You, and others. "Chris’ experience, musicianship and patience are the key qualities of a well-rounded teacher." "I've known Chris Beers for many years and have gigged with him in all kinds of settings: rock, blues, jazz, country, ragtime and more. He's a solid timekeeper with a great natural groove and his playing is not only rhythmically interesting, but musical in its own right. I've called him for my own gigs, played with him in bands where we were both sidemen, and passed along his name for gigs I wasn't even on. I'd recommend him to anyone." "A pro to work with. Creative, musical and proficient." 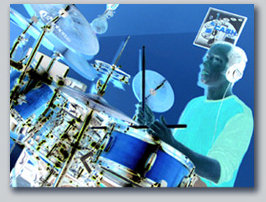 "A solid drummer and all-around professional musician. Stellar work." "Innovative ideas and techniques that really helped my independence and musicality." "I always look forward to my lessons! I am learning a lot and having fun, too." "A drummer/percussionist who plays for the groove!" "Loves kids, drums and teaching rhythm."